► Sam Kurker will join the second power play unit with Sahir Gill dropping back to the point in a move aimed at giving blueliner Sean Escobedo some added rest. 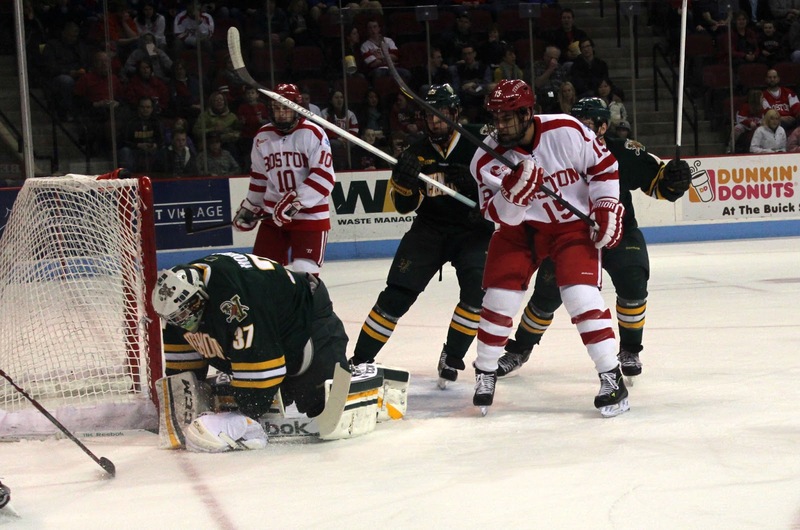 ►BHH reports that, should BU advance to the Hockey East semifinals, it is possible that injured defenseman Garrett Noonan may be available to play. Boston College PA announcer Tom Burke, who has covered college hockey in Boston since 1969, offers perspective that is both historical and personal on the Terriers’ longtime head coach. In the EJHL playoffs, Islanders Hockey Club eliminated the Valley Junior Warriors, ending the EJHL season for 2013 recruit Brendan Collier. The left wing from Charlestown, Mass., had a 15-33-48 line in 49 games. Thursday night, 2014 recruit Jack Eichel scored his third goal since his call up to the NTDP U18s late last month in a 4-2 win against Cedar Rapids., Eichel, who had 19 goals and 15 assists in 36 U17 games, also added an assist, earning second-star honors. He has six points for the U18s. Life on the road in the minor leagues is “un-fun” according to Kieran Millan, who plays for the CHL Denver Cutthroats. One particular road trip proved especially annoying. Millan is a finalist for the CHL’s Most Outstanding Goalie award. Rick DiPietro stopped 30 shots in Bridgeport's 3-2 OT win against Springfield.